On March 27, 2018, Fairmount Innovation Lab (FIL) celebrated the final pitches of fourteen companies that participated in FIL’s Launchpad program, including consumer tech, food, and design companies. These fourteen companies competed for $3,000 in prize money and $3,000 in-kind donations, including co-working space at FIL and a legal consultation. Judges included Eric Uva, Director of Small Business Lending at LISC Boston, Joel Kinney, Partner at Fort Point Legal powered by Casner & Edwards and Parul Singh, principal at Founder Collective. All companies pitching successfully completed FIL Launchpad, a 12 week customized program consisting of weekly presentations, peer-to-peer learning, mentorship, pitch practices and access to a variety of subject matter experts and a community of entrepreneurs. 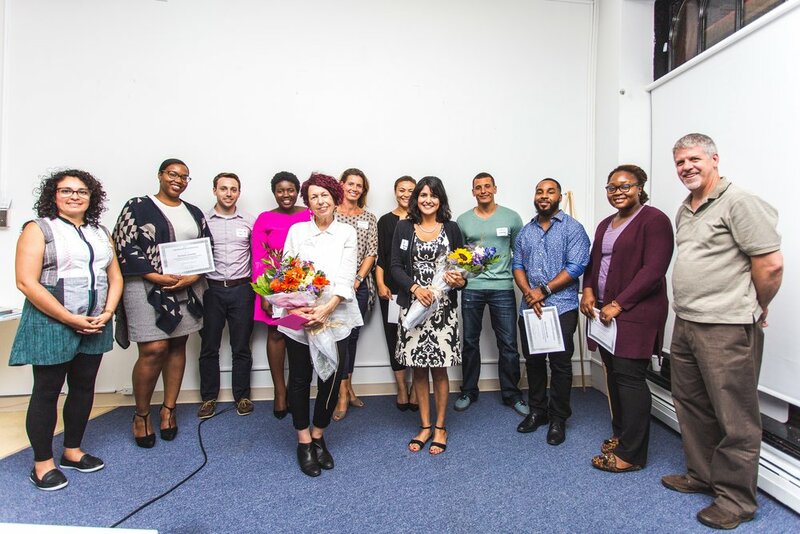 “As a mentor, it’s amazing to see these companies start off as diamonds in the rough, and in just three short months, turn into formidable ready-to-launch businesses,” added FIL Mentor and Founder and Principal of DPA Communications, Dominic Amenta. So far, over 50 creative and social enterprises have participated in FIL Launchpad programs including ExpressCuts 10.18, Natralee, I am Kreyol, Queens Co, Study Buddiez, The Bold & Beautiful Women Circle, Jewelz on Demand, Beauty N Simplicity and So Gutsy. “I am so impressed by the progress the cohort made throughout the program as they applied learning about idea validation, market research, pricing, sales, marketing and branding, finances and developing a compelling story and pitch to their companies. There were 14 diverse companies that worked well together, learning and supporting each other through their entrepreneurial journey,” added Anuradha Yadav, FIL Launchpad Facilitator. FIL is lucky to have amazing partners and sponsors to support this program, including Mass Growth Capital, LISC Boston, Fort Point Legal powered by Casner & Edwards, Dorchester Bay Economic Development Corporation and Boston Private Bank. Stay tuned to our website and social media as to when we will be recruiting for the next FIL Launchpad class. FIL supports creative and social entrepreneurs in Massachusetts through programming, events, an accelerator program for early stage creative and social impact companies, co-working space, pop-up partnerships and a maker space. Located in Uphams Corner in Dorchester, FIL is part of the Fairmount Cultural Corridor, a collaborative initiative and partnership which draws upon the Fairmount Commuter Line to support diversity, livable neighborhoods and a sustainable, local, creative community. For more information, please visit our website at http://www.lab584.org/. 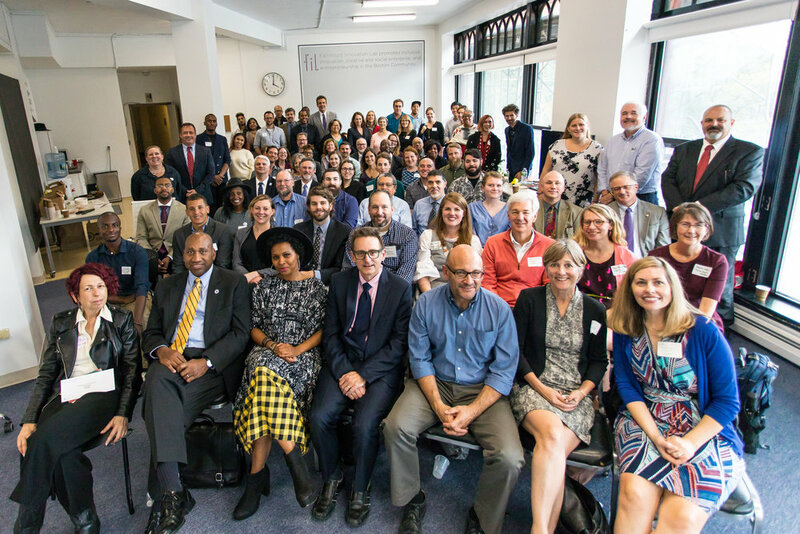 Boston, MA - On October 26, 2017, government officials and philanthropic supporters, including Jay Ash, State Secretary of Housing and Economic Development, Lauren Liss, President and CEO of MassDevelopment, Julie Burros, the City of Boston’s Chief of Arts & Culture and San San Wong, Senior Arts Program Officer for the Barr Foundation, gathered at Fairmount Innovation Lab (“FIL”) to hear Secretary Jay Ash announce the most recent round of Collaborative Workspace Program grants, including an $85,000 grant for FIL to develop and equip 3,050-square-foot of collaborative work space at 594 Columbia Road. This is the second time that FIL has received a grant from MassDevelopment. In December 2016, FIL was awarded a $25,000 to grant to conduct a feasibility study.